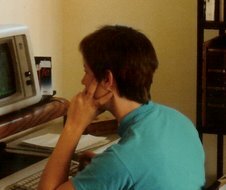 At a recent visit to the eye doctor, he started explaining to me about the research studies on blue light from LED bulbs and computer screens, how long-term exposure interrupts our circadian rhythms. "Remember those old ladies who used to have blue-rinsed hair?" "Um, yeah," I said. Where was he going with this? "Actually, as the eye ages, people become less sensitive to the color blue. So they thought they were correcting the ugly yellow color of their hair. To them, their hair looked pure white. They didn't see the blue." Could this be right? Well, yes and no. Maybe some women's eyes/cataracts fooled them into thinking their hair looked white, but others were making a definite beauty statement, following the lead of movie star Jean Harlow. 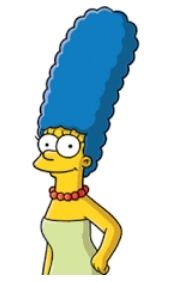 In the 21st century, we can't help but follow the lead of that stunning cartoon star, Marge Simpson. Browsing about blue hair opened a wider vista than I thought possible. Wikipedia has a page devoted to it here. Did you know, for instance, that artistic depictions of the Buddha often show him with blue hair? "This artistic convention emphasizes the blue element in the 'blue-black' hair said to be one of the 32 special physical characteristics of the Buddha." Oh my.